I've had scooters for the past 23 years, having bought my first on my 17th birthday from Kegra in Southend. 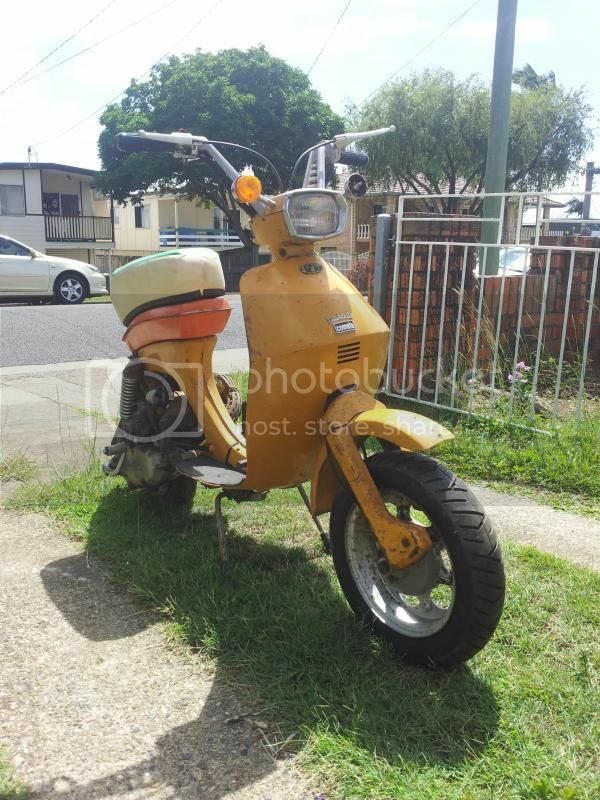 I moved out to Australia a few years ago and have been trying to get my scooter out here. I have just picked up a barn-fresh Cometa SL this morning, and to my amazement, it started first kick. It didn't stay alive for too long, but it did start! I've had the carb off and flushed everything through and give it a good clean, but it still won't idle without the choke on full. I can't see any blockage and it's got me scratching my head. It needs a bit of TLC and time, and I've got plenty of that so I hope to have it looking decent in a short while. How you manage to get the Cometa? I'm doing a Vega. I'm in Sydney. I'm in Brisbane. Got the Cometa from my father-in-laws brother. They are from Sicily but I'm not certain it was brought over by them. I am trying to get some more information. Think they might have bought it here. It's an Australian machine. Indicators were unique to Oz, except a few that slipped into the UK when Lambretta Concessionaires closed up shop here. Here's some pics of mine. It has moved on a bit since these were taken. Been a long time. Tony Liney, of Carz and Scootz in Brissie, is doing a Vega. Welcome Stabs. There's folk on here that know stuff so feel free to 'pick brains' We're a small but select group and don't be put off if the forum goes quiet for a while it always picks up again. Re your new find it's almost certainly the pilot or starter jet got some crud in it. It doesn't take more than a speck. Worth finding an ultrasound cleaner. Not a bad thing to have in the workshop and useful for other jobs as well as cleaning jets. Hi Stabs, yes welcome aboard. Nice Cometa there lots of patina deffo ride "as is" in my view. With the non tick over problem make sure the air filter is useable and not restricting air flow also check the tick over adjuster isn't too far out. I take it you did put fresh petrol in there from the barn find ???? I shall get into the carb again and have a good poke around. Dare I say it, I am more used to Vespas, so this is all pretty new to me! The choke has what looks like a grenade pin on it, and as long as this is 'up' then no problems. That just ain't right though? Right? The air filter is in a Myer bag along with a load of other bits and bobs (indicators etc) that came with the bike. Would that have an effect on the idle if not currently fitted? Ultrasound cleaner....first I've heard of those. Where would I find one of those? My name is Richard but no-one calls me that! the grenade pin is the choke, which lets in extra fuel. So that tells me that you aren't getting enough fuel. How many indicators do you have? You certainly have a broken one. Good news is that you can get new lenses. Indicator bodies, not so easy. Switch - bloody impossible! Will help you track down parts. Your seat is wrong, but you can get a new cover. Be interesting to see the rest close up. Siobhan...just been and checked the indicators in the garage. There is one that matches the ones at the front, and three more bulbous rounded ones. So if the choke is up and she runs fine, then there's enough fuel getting to the carb, but something is blocking it when the choke is down? So you are missing an original style indicator and a single lens? Yep, enough fuel to the carb. Clean all the jets out. Indeed, clean the entire carb. There is a mix screw on the side of the carb. That should be at 1.5 turns. Thackers...I just put oil in the 'lubematic' tank at the back. Am I doing something wrong there? Siobhan, as far as I can tell, I need a new bulb on the left hand side front, and a lense, but I have a spare complete front indicator in the Myer bag so I can just chuck that on there. Would the more rounded indicators be for the rear? no, all the indicators should be the same, so you are missing one and a lens. Concentrate on the mechanics, I may be able to help you with the indicators (Wont be cheap as I have to replace them, but I only charge what they cost me). Do you have the rear number plate brackets and rear light? No Siobhan...no rear light, no brackets. OK, I have the bracket (the one for indicators) and I have spare rear light. be good to get a number of photos all over the scoot so we can see what's missing, etc. I will get some more photos when I get a second and post them up....hopefully there's not too much missing! The clutch needs some attention as the bike stalls when I put it into gear, even with the clutch in. New cables needed too, and I've been browsing Lambretta.co.uk for bits and bobs. Thanks for all of the feedback everyone! Ron De Pannone in Perth, he has some cables, etc for Vega.